My grandma and grandpa with one of their nine children. Sadly this weekend we laid my grandmother to rest, she was one of the most compassionate, strong and gentle women I have ever known. At her knee I learned what it means to lead by example to lift others up instead of holding them down and to use my station in life, what ever it may be, to contribute to the well being of others. Without her there very likely would never have been a Daycare Diva and I am thankful everyday for her tremendous influence in my life. As I was going through my grandmother’s things I found two letters I wrote her thanking her for all she had done for me over the years. It brought me some comfort knowing she had kept them even if she didn’t remember them at the time of her passing. This the speech I wrote to share some of the ways she touched my life with the friends and family who gathered to commemorate her life. It is my final feeble attempt to thank the woman who has done so much for so many. This is the cradle my grandma rocked her children in then later taught me to rock my brothers and sisters in it as she sewed when we came to visit. I loved that cradle. For those of you who do not know me my name is Geraldine. I was named for my grandmother and as a small child I was not very proud of my name. Nobody that I knew had the name "Geraldine". No matter how hard I searched I knew I would never find the name "Geraldine" printed on birthday balloons or etched in sparkly pencils like all the other names of normal girls I knew. For a time I was heartbroken that somehow I had been chosen to carry the curse of having the most unattractive name in a house full of girls with normal names. One day after being teased relentlessly for my name, I asked my mother why she gave me such a horrid name. She reassured me that my name was not horrid and that it was in fact a very special name. She told me that I should be thankful because as first born I had been granted the privilege of being named after my grandmother and that was a very special thing. 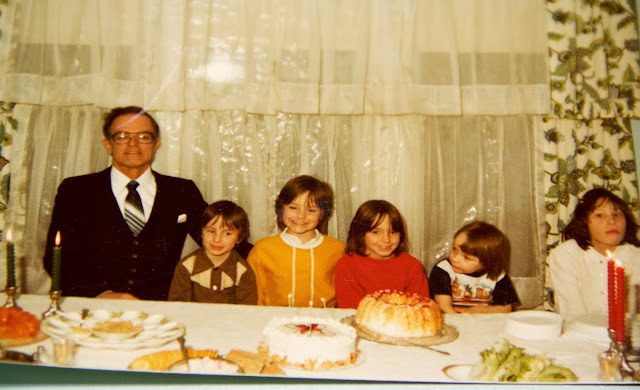 I'm the ridiculously optimistic kid in the mustard yellow shirt, pictured here with my brother Bill, (me) my sister Tina and my sister Jennifer. According to most baby books Geraldine means spear mighty or ruler of the spear. The first time I read the words “Spear mighty” the definition didn’t seem to make sense. I felt like it was an even bigger insult to have a name that had such a boyish meaning when both my grandmother and I were so feminine. Now that I am older and a little wiser I can’t imagine how I ever thought of my grandmother as anything other than spear mighty. My grandmother was a quiet little woman with the patience of Job. Those who truly knew her would have agreed there was a mountain of a woman wrapped up in that tiny whisper of a body. In her younger years my grandmother raised her own nine children. My grandfather often bragged about how she also opened her doors to care for countless other children as their mothers ventured out into the workforce. 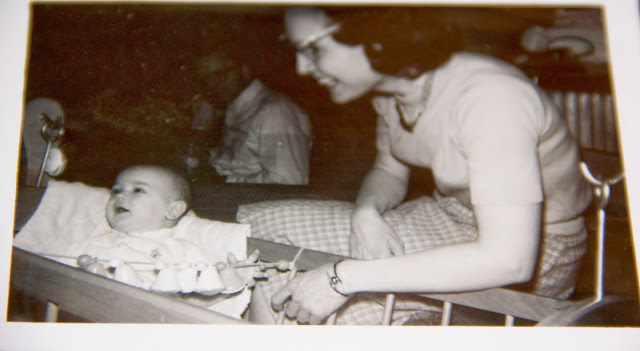 Being the oldest granddaughter it was evident to me from a very young age that my grandmother had an almost holy reverence for motherhood and the art of nurturing. She made me want to be a good and loving person because I knew how wonderful it was to be loved by a good and wonderful person. I do my best to practice that kind love each and every day by sharing it with the children I teach. Birds of a feather: This is my grandma's good friend Maxine who used to take inner city foster children on our camping trips. Some of Maxine's friends discouraged her from taking the kids especially since she was dependent on a walker. They worried for her safety and thought "those kids" were untrustworthy. Maxine insisted that ALL kids just need someone to care about them, spend time with them and give them a hug. It was remarkable even as a child to see how the foster children looked after Maxine and treated her with the utmost respect. Nobody ever fought about doing chores at her campsite and there was always a lot of love. By virtue of her inherent goodness my grandmother was a spiritual powerhouse. Evidence of her spiritual beliefs extended far beyond the church pew out into the streets where she regularly fed the homeless, brought books to the housebound and visited fellow church members who had fallen ill. In fact her compassion was so great that one of her dearest friends told me with tears in her eyes that my grandparents were the only two people who would visit her son as he suffered through the final stages of AIDS. No one else was brave enough or kind enough to set aside their judgment of him and offer the compassion he desperately needed. She wanted me to know that it meant the world to her. Amid all the chaos of clamoring children and her commitment to her spiritual practice grandma put herself through nursing school. She persisted until she earned her degree despite the fact that it must have been unimaginably difficult to do so. Then she worked the night shift in a local hospital taking care of even more people. In 1977 - the heart of the feminist movement my grandmother received her nursing degree. The youngest of her nine children was only about nine years old. She told me that she struggled relentlessly with reading comprehension and that studying was tremendously difficult for her. I later discovered she received a D in her earliest nursing classes, obviously she didn't let any of that get in the way of achieving her goals. Even though she wan’t the kind of woman to go on about her accomplishments grandma was pretty proud of that nursing degree. For years her graduation picture hung over the couch as evidence of the value she placed on education and her role outside the comfy confines of her sweet smelling home. Seeing her take joy in having something for herself in a time when women were encouraged set their own dreams aside in favor of devoting themselves to raising children, taught me that as a woman it was good to have personal goals and it is important to make an investment in myself. 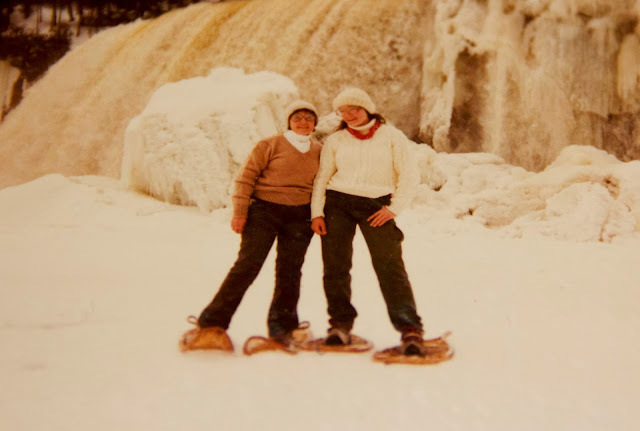 Once her children were rooted in their own lives grandma climbed mountains, cruised oceans, rafted on raging rivers, hiked, biked and traveled to faraway lands. She was bold enough to create space in her life for experiencing things outside her comfort zone and she had the wisdom to know it was important to do so. As I grew up listening to her tales of adventure it became evident that giving to yourself is just as important as giving to others. In fact when we give to ourselves we have so much more to offer the people in our lives. Because of her I learned that altruism is even more beautiful when it is balanced against the backdrop of a life richly lived. My grandmother snow shoeing on a trail up north. She had countless photos of various different adventures with the names and dates carefully inscribed on the backs or bottoms of her photos. I would have to say that my grandmothers legacy in this world is the swift, silent and precise trajectory of the many ways her acts of kindness, bravery, love, compassion, spirituality and goodness will leave an indelible mark on lives of those who loved her and that those actions will echo forth into countless generations to come. If I live to be half the woman my grandmother was I will consider myself very fortunate indeed. A small handful of her many grandchildren and great grand children.